Anyone who has ever had a muscle knot in the back knows the pain that it can cause and the frustration when you 'just can't reach' the right spot. Well, the Back Nodger is a simple tool designed to eliminate that frustration. It enables users to finally get at those impossible to reach spots and perform self massage in order to relieve muscle tension and knots. The simplicity of the design makes this usable by anyone, at home or at work. 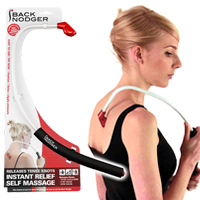 The head of the Back Nodger acts like a masseur's thumb, able to exert intense, targeted pressure into knots. The strong steel frame permits you to use the maximum amount of pressure that 'you' want, with no concern of creating pain by exerting too much pressure since you are in total control. The non-slip foam handle ensures firm control and the Direct Application Point on the handle can be used to exert deep pressure into arms and muscles within easy reach, making this a tool that can be used on all parts of the body.